I have been holding onto this announcement for a while now, and I know some of you have been waiting ever so patiently, but I can finally announce the next book in the ALLEVON series by Written Backwards. If you’re not familiar with ALLEVON, these are smaller, illustrated, trade paperbacks from some of the best writers of speculative fiction working today. The name of the series is “novella” in reverse (What else would you expect from a imprint of Dark Regions Press called Written Backwards? ), and focuses on original fiction under 40,000 words. 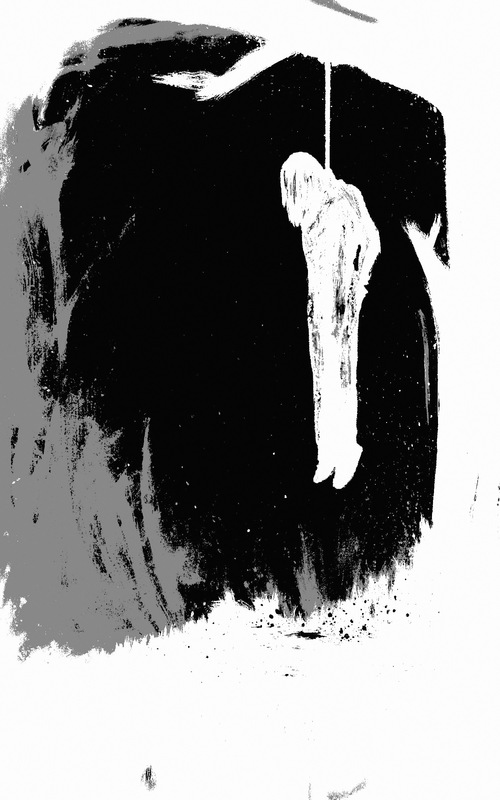 The first book in the series, At the Lazy K, by Gene O’Neill (an award-winning writer of science fiction, fantasy, and horror), was a novella published in May 2015, and featured illustrations by L.A. Spooner, as well as an introduction by Rena Mason. So, how do you follow a book that is part western, part ghost story, part drug-rehabilitation, and a literary, multi-genre exploration into the rich cultural history of northern California? Since I’ve been holding onto this announcement for a while, this also means I’ve been working on this book for a while, and so it’s nearly finished. Yes, if everything goes well, expect a mid- to late-August release date! The Horror Writers Association recently announced the Preliminary Ballot for the 2015 Bram Stoker Awards®, and I am proud to announce that I have a few things that made the list this year, and have a bunch of friends whose work made the list as well. The Library of the Dead, by Written Backwards (now an imprint of Dark Regions Press), made the preliminary ballot this year. Many fingers are crossed that it finds its way onto the final ballot. Qualia Nous was officially nominated last year for Superior Achievement in an Anthology (although it bowed to Ellen Datlow’s Beyond Symmetry), and two short stories from the anthology took home statues for Superior Achievement in Short Fiction (Usman T. Malik’s “The Vaporization Enthalpy of a Peculiar Pakistani Family” and Rena Mason’s “Ruminations”). Norman Partridge’s “Special Collections” from The Library of the Dead made the preliminary ballot as well for Superior Achievement in Long Fiction. His introduction/story starts off the anthology, and apparently impressed the HWA’s long fiction jury. 1. The Library of the Dead – Superior Achievement in an Anthology. I hope to see The Library of the Dead on the final ballot alongside those I admire in the world of anthologies: Ellen Datlow (The Doll Collection), Christopher Golden (Seize the Night, which has an incredible long fiction piece called “Paper Cuts” by Gary A. Braunbeck, which also made the preliminary ballot for long fiction), Stephen Jones (Horrorology), Jonathan Maberry (X-Files: Trust No One), and Richard Thomas (Exigencies). See below for the complete list. The long fiction category is always one of my favorites. Along with rooting for Gene O’Neill for At the Lazy K, the long fiction category this year includes Norman Partridge’s “Special Collections” from The Library of the Dead… as well as an incredible story by Scott Edelman called “Becoming Invisible, Becoming Seen” and Gary A. Braunbeck’s “Paper Cuts” and Mercedes M. Yardley’s “Little Dead Red” and other fine stories. I’m also excited to see that Shadow Show: Stories in Celebration of Ray Bradbury made the preliminary ballot for Superior Achievement in a Graphic Novel, which Mort kindly gave me a copy of when I made a surprise visit in Chicago last October. As previously mentioned, Horror Writers Association voting members may request a PDF or print copy of The Library of the Dead (anthology), and/or At the Lazy K by Gene O’Neill (long fiction), and/or “Special Collections” by Norman Partridge (long fiction) for consideration by emailing written@nettirw.com. They will also be made available on the HWA message board. Congratulations to everyone who made the preliminaries this year! And congratulations to those who did not make the list, but probably should have. 2015 was a great year for horror fiction. I see familiar names on the list this year, and names I don’t recognize, which is either a good thing, or a bad thing. Some I have published, some have published me, and some have shared the table of contents with yours truly in various anthologies or magazines over the years. And some, well, perhaps someday I can say I recognize those names as well. 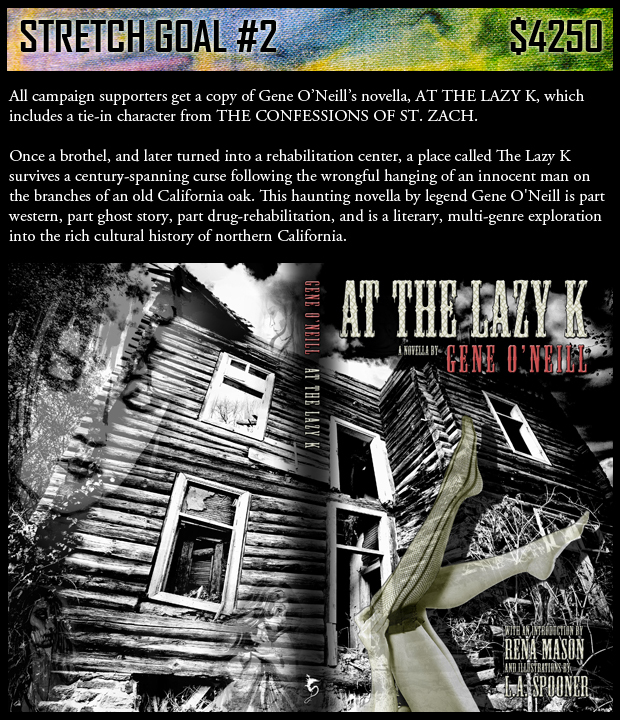 At the Lazy K, the latest novella by Gene O’Neill, is now available at Amazon.com (click the image above for a direct link to purchase). 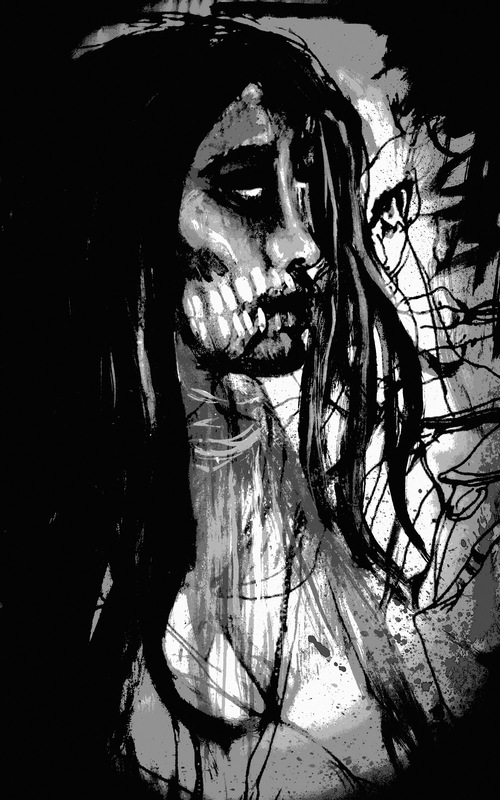 With interior illustrations throughout by L.A. Spooner (some of which are sprinkled throughout this post), and an introduction by Bram Stoker Award winning author Rena Mason, this smaller, matte-finished book fits nicely in the hands and digs instantly into your heart. This is Gene O’Neill at his finest. Gene O’Neill is a multi-award winning author of science fiction, fantasy, and horror, with over 150 works published, including stories filling the pages of Twilight Zone Magazine, Cemetery Dance Magazine, and The Magazine of Fantasy and Science Fiction. Gene is not a stranger to Written Backwards; his fiction has appeared in nearly every anthology, including Chiral Mad, Chiral Mad 2, the Bram Stoker Award nominated Qualia Nous, and most recently The Library of the Dead, an anthology he and Gord Rollo first conceived. 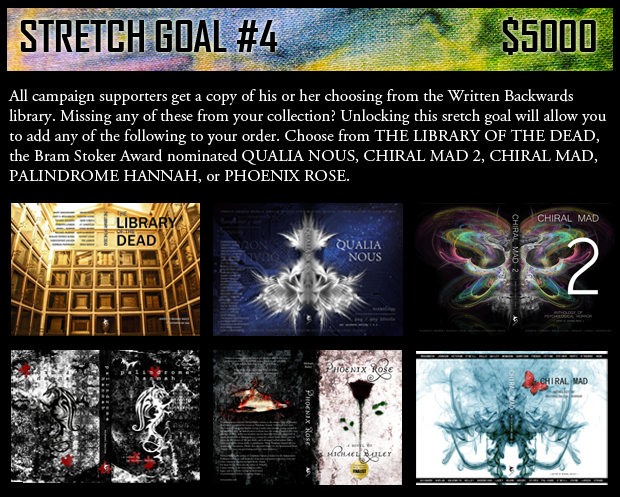 His short story “3-Dot People” will also be included in Chiral Mad 3. And look soon for his Cal Wild series, a colorful collection some are calling his magnum opus, which includes The Confessions of St. Zach, The Burden of Indigo, The Near Future, and The Far Future. This is the first of the ALLEVON series of illustrated novellas by Written Backwards, and Gene is the perfect way to start this ambitious new line of books. How many novellas released each year by Written Backwards is yet-to-be-determined, but each new release will be carefully and beautifully crafted, such as this one, and each will be authored by different writers of various genres, and each will be illustrated by different artists. What can you expect with At the Lazy K? Once a brothel, and later turned into a rehabilitation center, a place called The Lazy K survives a century-spanning curse following the wrongful hanging of an innocent man on the branches of an old California oak. 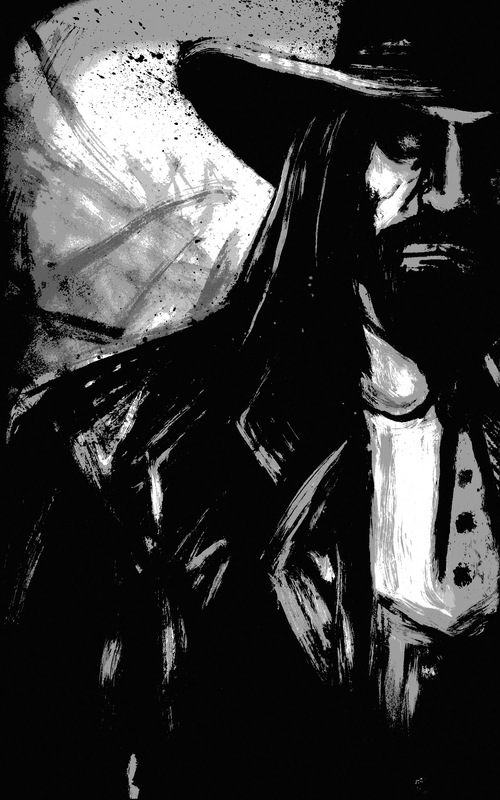 This haunting novella by legend Gene O’Neill is part western, part ghost story, part drug-rehabilitation, and is a literary, multi-genre exploration into the rich cultural history of northern California. At the Lazy K was recently released at Anthocon in Portsmouth, New Hampshire, where Gene served as a Guest of Honor, along with Thomas F. Monteleone, Christopher Golden, Holly Newstein, James A. Moore, artist Guest of Honor Susan Scofield, and surprise guests F. Paul Wilson, Gord Rollo, and gak, who illustrated The Library of the Dead. Pick up a copy of At the Lazy K by clicking here, or follow the link for a peek inside.